The Bronks children’s and youth theatre in Brussels aims to bring these age groups into contact with a wide range of performing arts. It stimulates the openmindedness of its audience without taking an unnecessarily infantile approach. This basic principle seems fundamental, but is at present by no means self-evident. The aim of recognising youngsters as emancipated art consumers is usually accompanied by a patronising tuning in to what is generally believed to be this target group’s world and formal idiom. The new Bronks theatre avoids this sort of paternalism by emphatically not recognising any inferiority to theatre for adults — neither in its programme nor in its architectural allure. The theatre building consists of a tangle of spaces, corridors and staircases that cross and meet each other in various ways. This is despite the fact that underlying it is a clear and ingenious architectural purpose. The design is defined by the theatre and the rehearsal room, two black boxes which occupy the maximum available area and volume of what is a fairly small building envelope. This was essential, since the local authority building regulations required that the design should remain strictly within the boundaries of the plot and the height of the cornice. The remaining parts of the schedule of requirements (reception, circulation, foyer, dressing rooms, offices, technical areas, etc.) are folded under, around, between and, when necessary, through the theatre and rehearsal room, twisted if need be. The in-between spaces thus created offer the immediate, practical advantage of acting as an acoustic buffer that screens the two large rooms off from each other and from the noise of the street. At the same time, the complex thread of spaces responds to the desire to create space with a shifting identity. Each space allows for variations in use, access and openness. This means that the spontaneous use of space, changes in patterns of circulation, unexpected visual contact and the constant presence of the urban environment traverses and short-circuits all its activities uninvited. In this way the spaces in this theatre repeatedly challenge its users — both theatre-makers and audience — and mediates their social interaction. 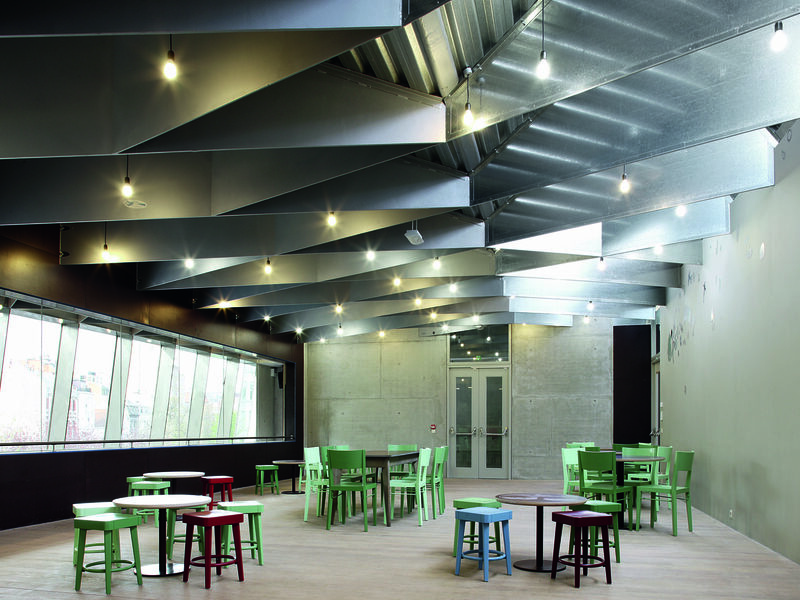 One striking example is the rehearsal room, which is raised above street level. This is extremely practical because daylight is able to enter and it is possible to look down into the reception area, which is below ground level and whose generous proportions enable it to be used for additional programmes. At the same time, the rehearsal room can be used as a stage facing the street or, the other way round, the life of the street can be used as a random stage set. The location of the dressing rooms also catches the eye, since they are raised pontifically above the stage floor in the large theatre. What is more, by providing the dressing rooms with a window as wide as the hall, there is an unexpected visual interaction with the audience and even the possibility of using the dressing rooms as an extension of the stage. Telescopic tiered seating additionally makes it possible to use the whole room as a stage floor, while windows on the lighting bridges let natural light in. Lastly, the shifting identity recurs in all sorts of unexpected places. In the décor of the toilets, which leaves the user a lot of room for interpretation in the division of both the public and private toilets and the ladies and gentlemen’s toilets. And in the view from the meeting room to the rehearsal room, which is a response to the artistic director’s desire to watch rehearsals unseen, but which also allows the room to be used as a control cabin during performances in the rehearsal room. The final flourish is the double staircase in the middle, which not only provides access to the halls at various heights, but was also given revolving mirrored walls, making it possible to direct the flow of circulation dynamically depending on the needs of the moment. It is striking that this theatre building constantly stimulates experimental use without excluding the possibility of a traditional set-up. In the rehearsal room, for instance, it is possible to restore tranquility by closing a sliding wall and thus excluding all interference from the street. In the main theatre a curtain also makes it possible to screen off the dressing rooms and expressly refrain from responding to the challenging architecture. In this way, Bronks has introduced an interesting reversal into the building of theatres. As a rule, when they are seeking alternative ways of relating to the audience, theatre-makers come up against the limitations of the spatial infrastructure. Bronks enables the theatre-maker to enter into a real struggle with the building to return to a traditional set-up and eliminate unwanted ambiguity. The challenge the design confronts the user with extends into the specific place a theatre occupies in the framework of society. A theatre usually isolates its users and visitors from the buzzing life of the city in order to satisfy aesthetic desires in complete calm and concentration. Bronks frustrates this sort of lazy relationship between the theatre-maker and consumer by means of a spatial setting that seeks ambiguous interaction rather than avoiding it. This is expressed very well by the large glass façade, which, stretching up over four storeys (reception, rehearsal room, balcony and café), guarantees close involvement between the creative theatre-makers and the multicultural neighbourhood. In this way, the theatre’s strategic, somewhat eccentric presence contributes to the upgrading of Varkensmarkt, a square that is languishing like a street that turned out too wide, plus the surrounding area.